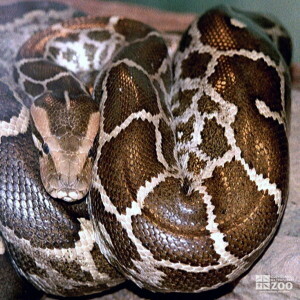 The range of the Indian Rock Python is India, southern Nepal, Pakistan, Sri Lanka, Bhutan, Bangladesh and north of Myanmar. The Indian Rock Python is found in a wide range of habitats including grasslands, swamps, rocky foothills, marshes, woodlands, open jungles, and river valleys and they rely on a permanent source of water. Over 100 eggs are laid by the Indian Rock Python. Rock pythons are nocturnal, hunting for mice, civets, small deer or birds. During the day they bask in the sun or rest in the shade. Indian Rock Pythons display a parenting behavior that is very unusual for reptiles, most of which provide no care for eggs or neonates. A female will lay her eggs and then wrap her coils around them. She then incubates them by making a series of muscular contractions all through her body which raises her temperature a few degrees. She does this intermittently during the 80 or so days it takes for the eggs to hatch. Once hatched, the young are on their own. Indian Rock Pythons feed on a variety of birds, mammals, and reptiles, but show a particular preference to mammals.